I'm spread far too thin to spend much time on the blog these days. Bear with me, it won't last forever. 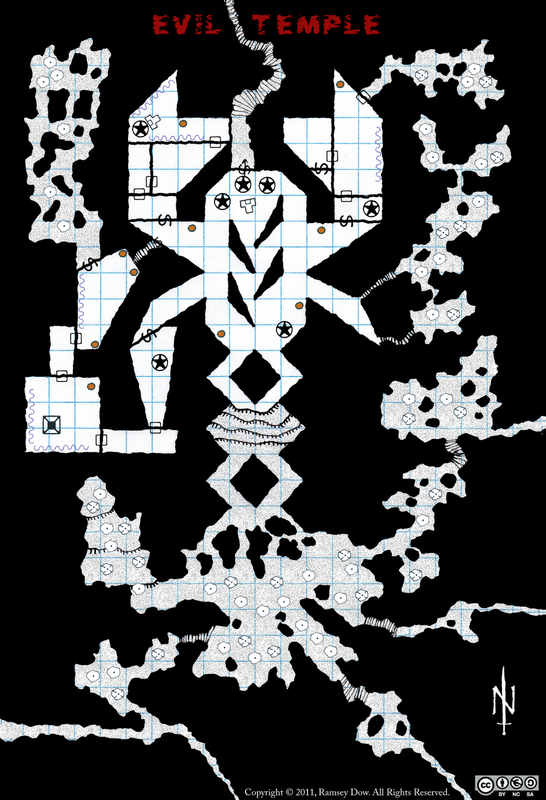 In the meantime, enjoy a map of an evil temple. This place is hidden deep within some caves in a lesser-traveled region of one of your dungeon levels. The approach is guarded by a contingent of humanoids of the most vile and disgusting sort. Fed sacrificial remains by the evil priests, they are as loyal as they are bloodthirsty. They will attack en masse, fighting to a particularly gruesome death, for their masters know no mercy. In addition to being wicked and cruel, these monsters are thoroughly diseased. The passage from their cavernous antechamber to the temple is awash in a sea of alien glyphs. Covering every conceivable surface, the spidery glyphs swim in the torchlight. Suddenly, the glyphs are leaping off the walls in droves! It would be a comical sight if it weren't for the animated glyphs exploding in your faces. Each bursts with unique energies, forcing terrible mayhem upon all. The true evil of the place manifests once the temple is breached. Dark sorceries swirl in chaos and fire. Braziers, lit one moment, swim in blood the next. Blood weirds leap to the attack while sinewy wights emerge from the shadows, their undead flesh smoking in the dim light. A strangely hypnotic voice intones a sickening chant that weaves between your thoughts. You realize that you might not make it out of here alive. I'm loving these maps. Very, very cool and much appreciated. @Paul: I use the CC BY-NC-SA license because it suits what I am doing: giving stuff to gamers for use in their games. My mission does not involve supporting game publishers. That said, if someone wanted to use my maps in an OGL context then all they would have to do is contact me to negotiate a waiver.